All about learning rhythm for people who think they don't have rhythm. Body percussion may be performed on its own or as an accompaniment to song. The folk traditions of many countries include the use of body percussion. Percussion instruments produce their sound when a player hits, scrapes, rubs or shakes them to produce vibrations. These techniques can also be applied to the human body. The body also presents several unique possibilities including the use of inhaled or exhaled air and vocal sounds. Stomp: Stamping the feet against the floor or a resonant surface. However, there are numerous other possibilities including: hitting the chest, whistling, slapping or flicking the cheeks with an open mouth, clicking with the tongue against the roof of the mouth, grunting and hitting the buttocks. Variations of sound are possible through changing the playing technique. For example, clapping the hands in various positions will affect factors such as pitch and resonance. Body percussion is used extensively in music education, because of its accessibility—the human body is the original musical instrument and the only instrument that every student possesses. Using the body in this manner gives students a direct experience of musical elements, such as beat, rhythm, and metre and helps a student internalise rhythmic skills. contemporary Body Music - music you can SEE, dance you can HEAR. Nice video about the drum circle at Meridian Hill Park in Washington, DC. 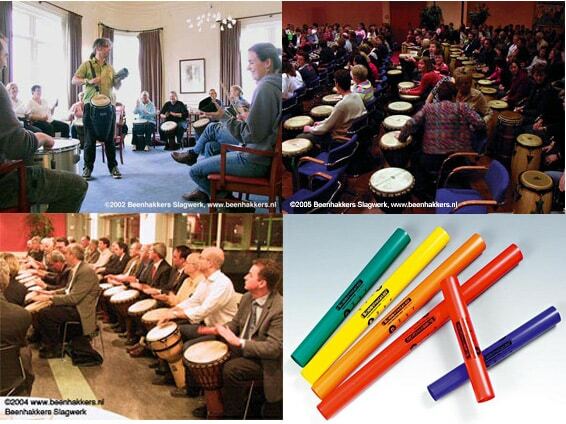 Percussieworkshops, energizers boomwhackers en drumcircles voor bedrijven, trainingen en groepen.